Now that summer is officially here, the heat is on. With highs in the upper 80’s or mid 90’s, I have been craving cooler stuff such as ice cream. Last year I tried some of the Popsicle from Wit & Vinegar’s Popsicle Week. As it happens this week is Popsicle Week! This year I am trying some of mine as well as some from past Popsicle Week recipes. Here are a couple I have tried this week that were so good! Bring the coconut milk to boil and add white chocolate bits. Warm until the chocolate melts. Mix well. Meanwhile lightly process the mango if using diced mango until blended into small bits. Mix in the milk mixture. Add cardamon and mix well. 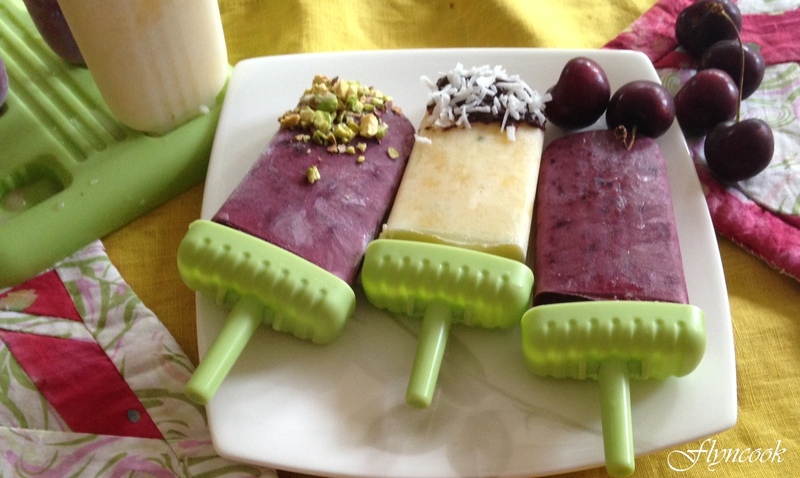 Pour into Popsicle molds and refrigerate for four hours. When ready to serve, eat them as is or melt some dark chocolate and dip the end of the Popsicle in it. Then roll it in some grated coconut. Enjoy! I also tried these cherry flavored Popsicle from here. Bring the coconut milk to boil and add white chocolate bits. Warm until the chocolate melts. Mix well. Meanwhile lightly process the cherries into bits. Add to the milk mixture and mix well. Just before serving, optionally melt some white chocolate, and dip the Popsicle in it. Next roll it in some pistachio bits. Enjoy!